[121 Pages Report] Backend as a Service market size to grow from USD 1.32 Billion in 2015 to USD 28.10 Billion by 2020, at a Compound Annual Growth Rate (CAGR) of 84.2%. The Backend as a Service market size was USD 0.79 Billion in 2014, which is projected to reach USD 28.10 Billion by 2020, at a Compound Annual Growth Rate (CAGR) of 84.2% during the forecast period (2015-2020). The increasing adoption of cloud-based applications, proliferation of apps and mobile devices, increased adoption of cell phones and smart devices, and demand for rapid time to deploy and develop, and increase in demand for BaaS service types by end-users, SMEs, and the large enterprises is expected to play a key role in fueling the growth of the market during the forecast period. The base year considered for the study is 2014 and the forecast period is from 2015 to 2020. The Backend as a Service market ecosystem comprises major BaaS providers, such as IBM Corporation (Armonk, New York, US), Oracle Corporation (Santa Clara, California, US), Microsoft Corporation (Redmond, Washington, US), Kony (Austin, Texas, US), and Kinvey (Boston, Massachusetts, US). Other stakeholders of the market include systems integrators, application designers and development service providers, and network service providers. 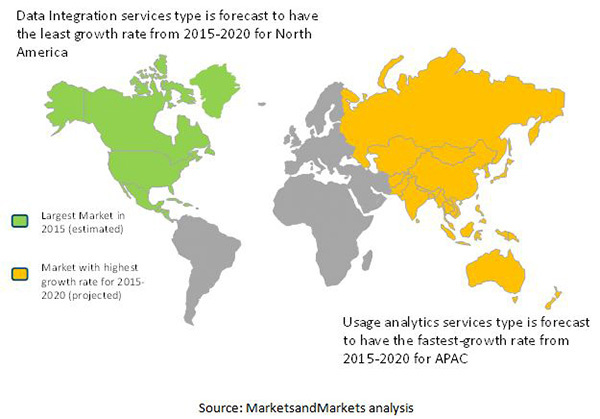 MarketsandMarkets forecast the Backend as a Service market size to grow from USD 1.32 Billion in 2015 to USD 28.10 Billion by 2020, at a Compound Annual Growth Rate (CAGR) of 84.2%. The BaaS is a middleware service which is very similar to platform as a service cloud computing service model. However, BaaS is different from platform as a service in the way that BaaS provides higher level abstraction to the developers. Over the passage of time, it has been observed that due to the proliferation of apps and mobile devices, the enterprises are developing enterprise applications to improve customer satisfaction and boost employee productivity. North America is expected to have the largest market share and will dominate the market from 2015 to 2020 owing to various innovations through research and development and technology and increasing demand for business flexibility and agility. The Backend as a Service market is expected to experience huge growth in Asia-Pacific (APAC) due to improved technology, cost efficiency, scalability, and improved productivity. Major factors that are restraining the growth of the market are lack of security and high initial cost of investment. The major vendors in the mobile Backend as a Service market include Microsoft, IBM Corporation, Oracle Corporation, Kony, Kinvey, AnyPresence, Appcelerator, Built.IO Backend, CloudMine, and KII Corporation. These players adopted various strategies such as new product launches, mergers and acquisitions, partnerships, collaborations, agreements, and business expansions to expand their product portfolios and increase their global footprint in the Backend as a Service market.